In his novel 'Book of Dave', Will Self imagines a world in the future where sea levels have risen over a 100m. This destroys civilization as we know it but leaves London skyscrapers still standing half underwater in the sea - the remaining humans who live on 'Ham' (an island created from the rising sea surrounding the high ground of Hampstead Heath, London) climb one of these which they call 'Central Stack' to capture seagulls. As the book has a map of Ham in the front I played around in Google Earth to see how accurate the boundary of the island actually was, as it happens, Will's imaginary island is what would really occur if sea level rose that far. Click the Temporary Places folder in the Places column (it will get a background) then right click > Add > Folder. Add a name in the dialogue box and tick the 'Show contents as options' box. You'll see why in a moment. Drag the dialogue box back into view and under the 'Style, Color' using the controls titled 'Area' select an appropriate color for the square (blue for sea level rise, white for an ice sheet?) also select an opacity of 30% or so. Under the Altitude tab choose an altitude of 100m and then select 'Relative to Ground' 'Absolute' in the pull down menu. This will raise your colored square 100m above the ground. Name your square something sensible but with a '100' in it (e.g. "London 100m") then click OK.
Now right click the element you created in the Places column and select copy. Right click the copy >Properties > Altitude and change the altitude to 200m. Change the name to replace 100 with 200 and click OK.
You should now have 2 sheets, one at 100m altitude and one at 200m. Clicking in the circles turns one on and the other one off automatically. Experiment with altitudes that works for your chosen location, copy and paste more sheets if necessary by repeating step  - within the folder you created only one sheet will be visible at any one time. Right click the folder and select 'Save As' to save and send to someone else. 3D Buildings: It's a lot of fun to turn on the 3D buildings layer whilst you have sheets visible in the layers column, as in the screeen shot the layers will show how deep buildings would be sunk in the sea - not sure if any of those in the screen shot are Central Stack. Absolute Heights: Experimenting with the levels, the sheet behaves oddly, it doesn't meet the land at the height you would expect. I'm not sure why this is but it may do with the curvature of the earth (in the middle of a big square the earth will protude through a level sheet even though there is no topography). If anyone has a definitive answer I'd like to know. Surface Flicker: If you zoom into the layers from a distance you may see line of where land meets sheet flicker and change. This is because GEarth creates the view of the earth you see by taking the satellite images and draping them over a set of 'posts' it builds rather like a marquee tent. If you view the ground from a higher altitude GEarth uses fewer posts so the surface changes as you zoom in and out. There is a way around this but its fiddly, I'll post about it if anyone's interested. This is great - really well written instructions, a nice quick easy project that can show you something local and relevant. Living in Southampton it only took a paltry couple of metres sea level rise to inundate much of the city - looks like my oceanography degree will come in handy! Cool! For global coverage, you can use Google Earth's Image Overlay feature: pick a blue image, view its properties, turn down the opacity, go to the Location tab, and set North/East/South/West to 90, 180, -90, -180. Unfortunately there are fewer options to set the altitude of the image overlay. I'd be interested in reading more details about posts and your way around the surface flicker. Cheers Rich, i've just finished reading the Book of Dave and wanted to do exactly what you have done here! Your instructions were perfect - I created the artificial sea across west and north London and saw the island of Ham miraculously appear! 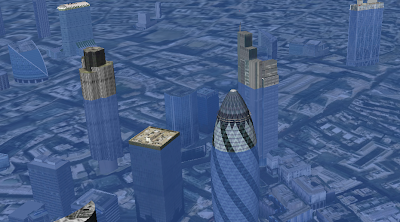 ...looking at the 3D plane view I would say that the "Sentrul Stac" of the book is the BT Telecom Tower. What did you think? Many thanks again for saving me several hours of head-scratching! Rich, you are The Geezer! I've just finished reading the Book of Dave and was wondering myself about the locations, and how realistic the map and directions were. I found your post on google and followed your instruction... and there before my eyes emerged the island of Ham - exactly as drawn in the book's map [I wonder if Will Self and the illustrator were doing something similar?]. From my own time living near Highgate I remember that the most distinctive feature on the skyline at night [much closer than the City] was the BT Telecom Tower - which with it's irregular top section, and smooth round sides - would make a perfect place for a seagull colony. Thanks again guv, for saving me many hours of painful head-scratching.